If you ever wished to send out a beautiful newsletter with Intercom without relying on a third party email service, then you have come to the right place! We love Intercom! The simplicity, the Interface, the features- everything Intercom has to offer is just pure genius. It allows businesses like ours have meaningful conversations with our customers and visitors right from our website or via email. Interacting with customers in real-time helps build trust and valuable relationships. It’s the one-stop-shop for all of your customer support! However, the only thing missing are easy engaging Intercom email templates for sending out newsletters to customers. Intercom’s email interface makes it easy to send out simple emails. but if you’ve ever wished to send out a newsletter as well, you’ve come to the right place. 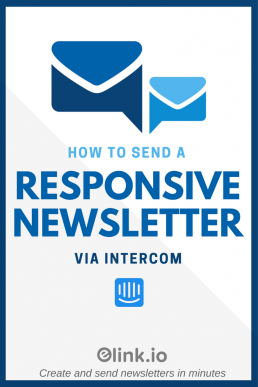 We’re going to teach you how you can send out a visually appealing and responsive newsletter with Intercom in minutes. It’s going to make your customer outreach a breeze. You’ll be able to remove the hassle of integrating your Intercom account with one of the larger email service providers! You’ve likely heard the phrases, “customer is number one,” or the “customer is always right” repeated over. Although they may not be the most inspiring phrases, the essence of the customer being central to any successful business is right. The primary goal of any business across industry and sectors is to satisfy the need and expectations of its customer. The only way to truly do this is through customer communication. In the digital age, communication has become so easy. Customers are being bombarded with messages across the web, on social media platforms, via email, etc. It’s as if businesses and brands are all standing in a crowd hoping the Beatles, Michael Jackson or One Direction (depending on your generation) will touch our outreached hands. Marketing experts estimate that most Americans are exposed to around 4,000 to 10,000 advertisements each day. Studies have shown that social media users consume 285 pieces of content every day. That equates to an eye-opening 54,000 words. All of this noise makes it difficult for companies to acquire new customers as well retain the attention of existing ones. The good news is, creative online customer service tools are popping up that help you establish better relationships. CRM or customer relationship management system is not just a buzzword. It has become a vital technique and strategy businesses need to differentiate themselves in the marketplace. Did you know that it costs 5x more to acquire a new customer than retain an existing one? It should provide helpful insights on what customers are interested in, along with what their buying habits are. Based on those understandings, personalized communication, prompts and notifications can be set up. 2. Profile customers and create a hierarchy of their importance. It’s impossible to be all things to all people. As a business, you have to define who your customer is and understand who they are. By profiling your customer, you can look for certain attributes like what referral path they came from, their country of origin, their demographics, etc. Regardless of whether your company is small or large, it’s difficult to truly maintain 100% personalization in all of your dealings with your customers. The best CRM’s allow you to ‘automate’ personalized interactions depending on user behavior. For example, if a user performs a particular activity or shows interest in a certain product on your website, you can trigger a message or email according to their behavior. It’s a clever way to make the customer feel they are getting special attention from your company. One key feature from CRM systems you should look at is those that help you identify problems, their causes and come up with solutions. It’s important that as a business, you never stick with the status quo and you constantly search for ways to improve and refine your customer interaction. Ultimately, you want your customer touches to help them succeed with using your product. There are numerous CRM tools available on the market for businesses to improve their relationships with their customers and prospects. One of our favorite tools that we use internally is…..
We can’t rave enough about it and highly recommend that businesses that require customer service online invest in this incredibly smart platform. Intercom is a customer communication platform that helps companies study and personalize their interactions with customers. It has a suite of integrated services to help teams regardless if they are involved in sales, marketing, and customer support. Intercom allows businesses to track and understand their customer behavior. It helps in understanding and examining areas within the platform where customers get stuck. You’re able to identify trends and find ways to improve the user-experience. Send in-app messages to your users based on their behavior and strike a conversation. The feedback you can receive when you’re chatting live with your customers is incredibly useful to form relationships, gain insights on how well you’re doing at meeting their needs and expectations. They have an incredibly easy and simple intuitive message editor that allows you to build message templates in minutes. With a few filter settings, you can choose what messages should be sent based on location, sessions, features used. If you’re looking for smart ways to retain customers, you can set up Intercom to send out emails and push notifications to users who sign up, but eventually drop-off. By re-engaging customers, at the right time, you can save time and money by bringing them back on board quicker. You can even use the in-app messaging feature to broadcast important company news like new feature announcement or releases and even encourage upgrades. Analytics also provides a way for A/B testing to improve your email, push and in-app messages performance by testing variants.With an array of smart features, Intercom truly is one of the best customer communication and management tools out there. Have you ever wished you could have Intercom take care of all of your email newsletters? It only makes sense as Intercom is your one-stop shop for all your customer interactions. However, the lack of interactive, engaging and responsive newsletter templates on Intercom forces us to pay for another service just to send an email newsletter. Perhaps you use a combination of MailChimp, Aweber, Active Campaign, or any other email marketing tool to take care of your newsletter needs? This creates an unnecessary overhead on your stretched marketing budget. All of your rich customer profile data is held on Intercom, why pay for another tool, just to export that rich data and send out an email newsletter? GET READY FOR SOME MAGIC! We have one BIG tip that existing and new Intercom clients will love! Brace yourself guys, ‘cause we have a way to help you consolidate your workflow while saving money and time. elink.io is a content curation and management tool that helps anyone create a visually appealing and mobile responsive newsletter in minutes! It is the easiest and fastest way to create an email newsletter. elink.io works by letting users choose a newsletter template and simply add the links to the content (blog posts, videos, documents, etc.) they want to share as a newsletter! elink automatically converts those web links into visual blocks with a picture, title, and a short description. You can add a header, some intro text, your company logo and/or tagline and hit submit. It’s that easy! You can even share the content of your newsletter with your email list as a responsive web page or as embedded content. Elink.io works perfectly with Intercom if you’re looking a quick way to a send visually appealing and responsive email newsletter to your customers in minutes. Just copy and paste the HTML code of your email newsletter made using elink and add it to your Intercom custom messages. Send the right message, at the right time, to the right person, with the right medium! Intercom allows you to customize your HTML code so that you can be in control of every bit and pieces of your email layout! I know what you’re thinking…ugh we just used the dreaded ‘code’ word. Not once, but twice! Elink has a variety of visually appealing newsletter templates to choose from. There are over 19 custom email templates to choose from and each template is responsive, so you don’t have to worry about the appearance of your newsletter on different devices with varying screen sizes. Copy and paste links to the content you want to share with your audience in your newsletter and elink will automatically generate a picture and a descriptive text regarding the link. You can share anything- tweets, youtube videos, google docs, pictures- basically any content on the web with a link! You can even make use of elink.io’s Chrome Extension to quickly add links to your newsletter quickly. It’s a smart way to save relevant content across the web and start creating your newsletter as you go through your normal online life! Step 3: Give your newsletter a title! The first thing your subscribers are going to read is your title. Make sure you make it catchy and appealing enough. To give a title to your newsletter, Choose “Header 1” template and add a header image and short introductory text. This is your opportunity to engage your audience and encourage them to read on. Step 4: Publish & Export! Hit publish once made sure that everything looks awesome and beautiful! After publishing, go to your dashboard and select the HTML button. Copy and paste the HTML email template code to your Intercom custom messages and there you have it! Your custom email newsletter is ready to be sent! EXPORT YOUR NEWSLETTER TO INTERCOM! In your Intercom dashboard, choose your audience, select email as the channel and fill sender’s details. Click on “Import HTML” in the bottom left corner. This how your newsletter will look like! Intercom provides a much more authentic and genuine experience for your customers than automated replies, which more often than not, look impersonal. This integration of elink and Intercom take that personalized experience to a whole new level and helps establish more meaningful relationships. Woo your customers with an amazing newsletter comprising of new product launches, how-to guides, help-center articles or anything you like and never let another customer slip away! This was a very informative post .